With less than two weeks until Christmas, families are getting ready to travel. Hotel stays are a must for many in between holiday destinations. When I travel, I usually stay at a Hampton Inn, Courtyard by Marriott, or Holiday Inn. They seem to work the best. It should be no surprise that hotels would want to hookup with a card manufacturer in order to promote their business. The most recent example of this would be when the Sheraton in Atlantic City and Upper Deck got together last summer. Room keys resembled Upper Deck cards for those people that stayed at the Sheraton while the National Sports Collectors Convention was going on. Its not the first time cards have been turned into room keys, but not something done very often. Items like that make unique souvenirs. The 2007 Upper Deck Holiday Inn set is nothing earth-shattering, but an interesting promotion nonetheless. 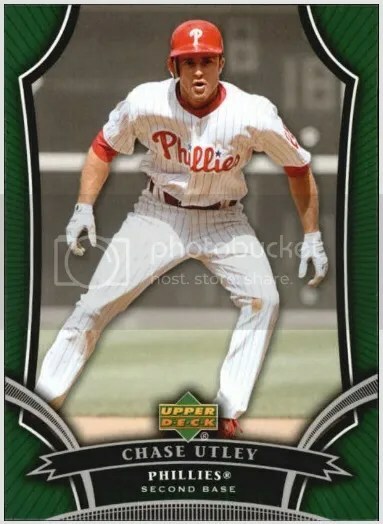 For those members of the Holiday Inn Priority Club that stayed at a participating Holiday Inn hotel between May 31, 2007 and July 30, 2007 received a specially marked pack of Upper Deck baseball cards. You got a pack for each night you stayed. Inside each pack there are (4) cards – (3) base and (1) Cal Ripken, Jr. insert. There are (5) Ripken inserts, and the entire base set consists of (60) cards. You won’t find any rookies, relics, or autographs. Adding at least one of those elements would have drastically increased people’s interest in this set. All of these cards can be found for next to nothing today. Holiday Inn isn’t a stranger when it comes to baseball. In 1977 they slapped their name on (70) collectible player discs. Given their age, they have a little more demand. Merchandise from Mickey Mantle’s Holiday Inn in Joplin, MO is quite popular. It doesn’t exist anymore. Right now a Lowe’s occupies that piece of real estate. You’ll regularly find memorabilia from it up for sale. Postcards, pennants, menus, and matchbooks carry decent value. Someone recently paid $250 for a sealed bar of soap.